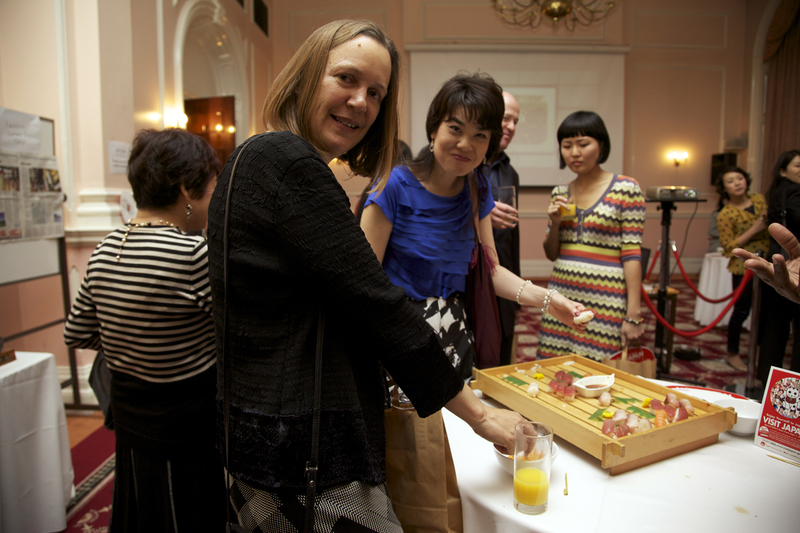 A LA JAPONAISE had launched its autumn festival, "Aki Matsuri"
at SNAP Studio in Old Street. I loved the white large room with interesting furniture. Handful of autumn on the table. 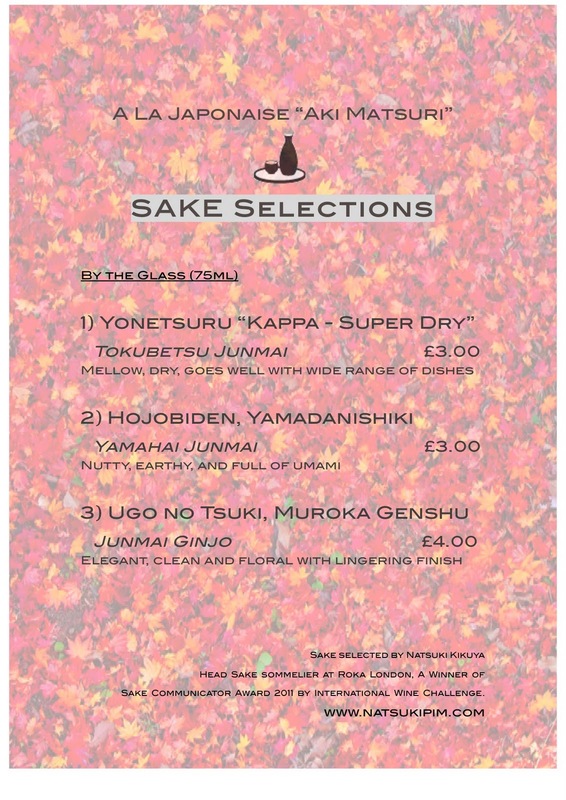 In Japan, Autumn is essentially a period of and harvests, marked by a spirit of abundance. 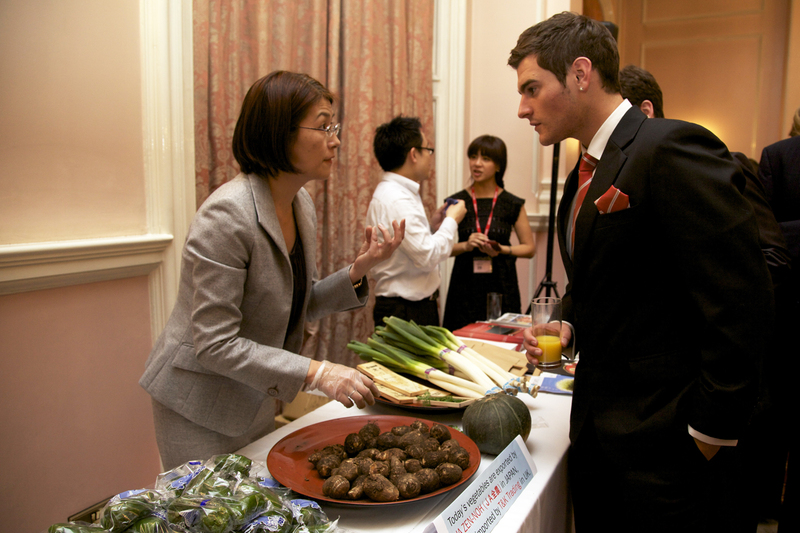 and taste the regional autumnal dishes. This time I got to make my Sake booth for everyone to enjoy with the meal. 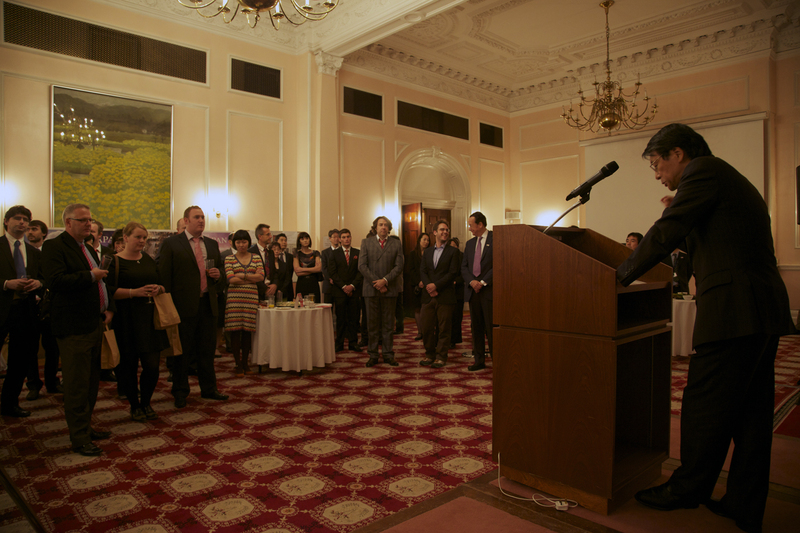 They are all from the breweries who had visited UK last September. I dressed up with Kimono, since the Halloween isn't far away! energetic Atsuko san and charming Elsa. Akira kun, who just moved from NY had was an assistant today. Thank you Michele for taking so many photos! First Dish: Autumn Harvest Plate. "From the Field" - quinoa and barley moromi miso and vegetables. It was fun and great evening with a wonderful team. I was glad that a lot of people tried many glasses of Sake. We will see you again in the winter season! 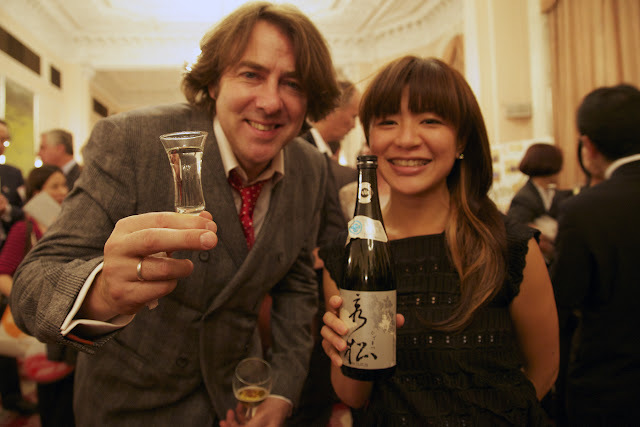 The famous TV presenter Mr. Jonathon Ross, Sake, and me! Their ballroom was full of people in the tourism and importing industries. safety and support on Japan after the March 11th tragedy in Tohoku region. The youngest Master Chef winner in 2011, Mr. Tim Anderson and Ambassador Mr. Hayashi. fell in love with the food culture, and learned and ate all the regional foods all over Japan. such as Umeboshi, dried & pickled Japanese plum and monkfish liver and turned into amazing dishes. The actor Matt Lapinskas was there as well. 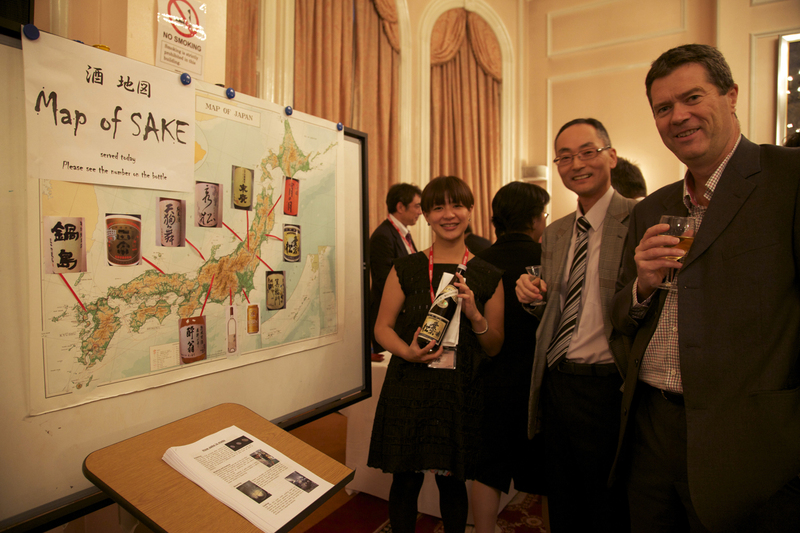 Sake booth was very popular! 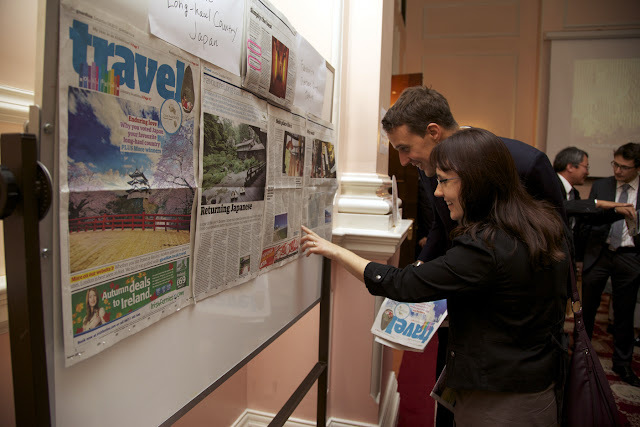 who came to help at the event during his busy stay in London. and enjoyed sipping the Sake remembering their memories. When there is Sake, there is the land coming from. 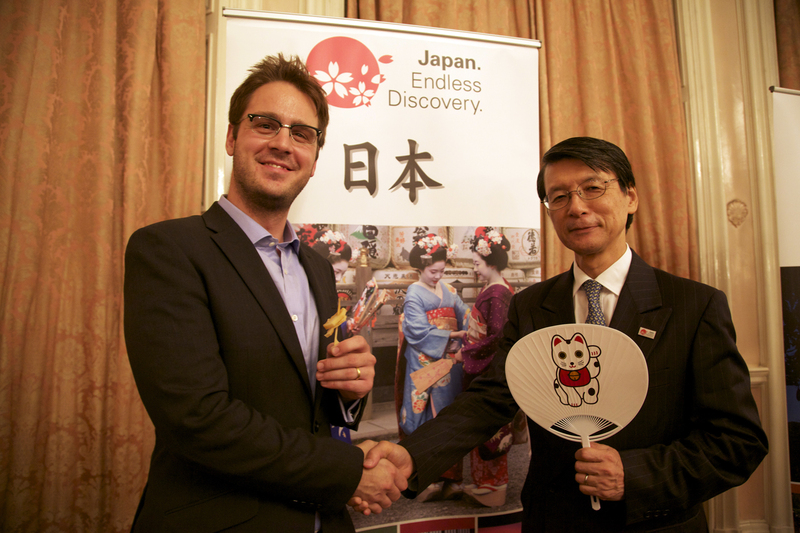 Through promoting Sake in overseas, I will keep supporting international tourists to visit Japan. Again big thank you for Mr. Yamazaki san, the Sake promoter at Japanese Embassy in London. the real meaning and goals of "promoting Sake in UK". I am very honored and happy to have these opportunities to work with him. sponsored by Divertimenti, one of the biggest kitchen tool store in London. With great Atsuko san of Atsuko's Kitchen! 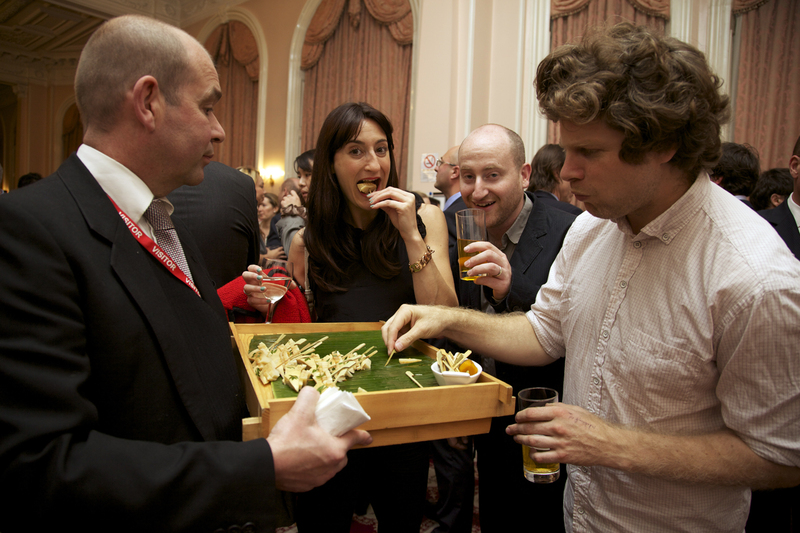 yet everyone was very enthusiastic because of their love of Japanese cuisine. Making Dashimaki Tamago, making Sushi rice, wrapping Gyoza. but soon got better and better and I loved to see participants enjoying to cook. and Yamatoshizuku, Yamahai Junmai (Akita prefecture). Yamatoshizuku Yamahai Junmai was served warm and male guests loved it. how to serve sake and match with food, where to buy and etc. Thank you very much Atsuko san! 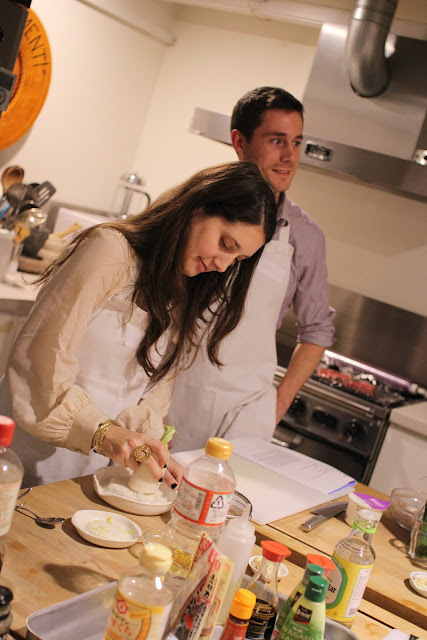 next collaboration is our two day pop-up restaurant named "A La Japonaise"! I will open a little Sake store there. 28th is fully-booked, there are still some seats available on 29th, please book! A la Japonaise is the brain child of Atsuko and Elsa, two professional chefs who have decided to make their native Japanese and French cuisines collide for a series of special culinary events organized throughout the year. Each month, we will celebrate the seasons and creating dishes with the most delicious things that Nature has to offer, "à la Japonaise". We will be following the festive Matsuri calendar. Our goal is to create a memorable dining experience serving you refined comfort foods to contemporary tastes balanced by traditional sensibilities and visual artistry.. All in all , a friendly and intimate experience! While our summer dining events were candlelit and held in an elegant Kensington garden, our autumnal dinners take a twist and take you the opposite way to the east end, to SNAP Studios, a renowned photo studio to take a peek on what's happening on the other side! For some, autumn is the mere reminder of the ending of summer, its greenness and its warmth. But in Japan, it is essentially a period of renewal and harvests, marked by a spirit of abundance. Just as for spring’s cherry-blossom viewing (sakura), thousands travel to contemplate the colour-changing landscapes (koyo) and taste the regional autumnal dishes. Luckily (or unluckily, depending on the time of the phrasing), our own British summers are easy to forget and they pave the way to wonderful autumnal gourmet seasons. Hence, our mission, this month, to show you that autumn is definitely the new summer, with its abundance of flavours and colours! Saturday 29th October 7:00pm *spaces are limited. Menu: Six-courses menu. *please let us know if you have any dietary requirements. 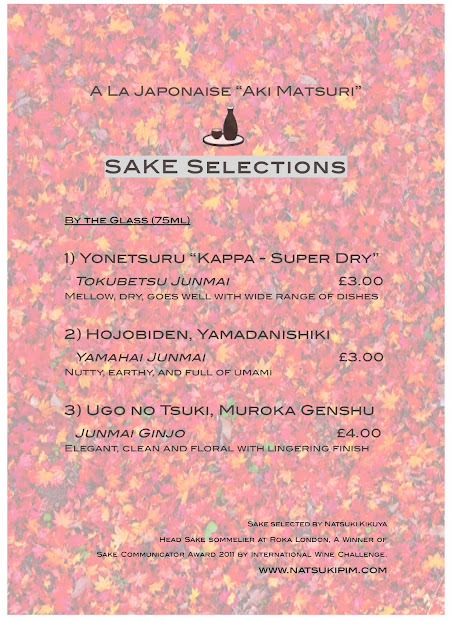 A sake bar will be held from 7:00pm with specially selected sake offered by our professional sake sommelier Natsuki, a winner of Sake Communicator Award 2011 of IWC.